Though we all know DNA structure is a right handed double helix, many of us will not be able to differentiate correctly a right handed double helix from a left handed one. 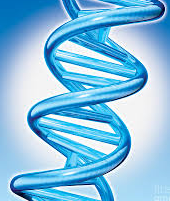 There are reputed places where one will observe a left handed DNA double helix structure being displayed (Fig. 1). I believe that a left handed double helix DNA structure has not been displayed there with a purpose; rather the responsible person may not be aware about how to define the helix handedness. 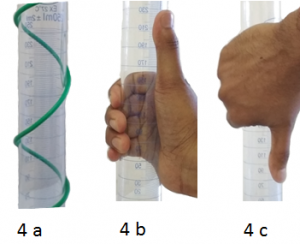 The right handed DNA double helix is shown in Fig 2.
a wire going spirally around a cylinder is presented as a mimicking situation in Fig 4a. A shown in Fig. 4b, imagine gripping the support using your right hand palm and the fingers except the thumb as shown in Fig 4b. Keep the thumb straight. The Fig 4b resembles to the climber plant holding the bamboo support (Fig 3 right side) or the wire going spirally around the cylinder in Fig 4a. Your thumb is straight facing upward, the direction in which the plant is moving upward. So the plant is moving towards right as well as in upward direction. 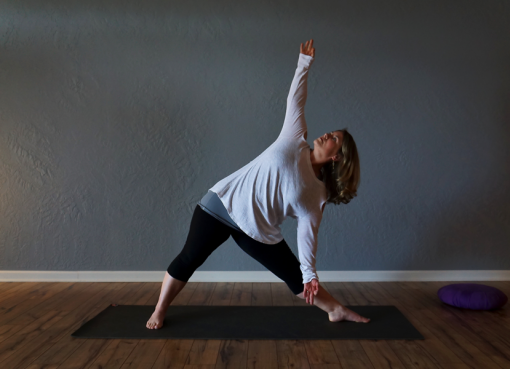 You can also hold the glass cylinder in your right hand pointing your thumb downward (Fig. 4c). 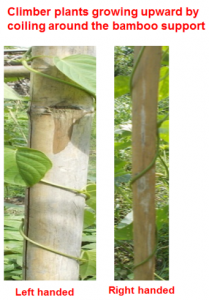 You will feel that the plant is wrapping around the bamboo support from right to left and moving downward. As you are able to explain the helical path using your right hand, it is a right handed helix. Let’s hold the glass cylinder in your left hand (Fig. 5b or Fig 5c). You will realize the thumb direction remaining towards the opposite direction of the plant movement (Fig. 3 right side). So you cannot explain helical path in Fig 3 right side using your left hand (Fig 5b). 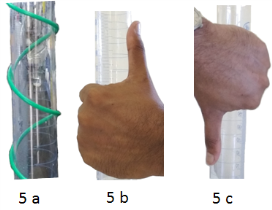 But in Fig 3 left side plant, or the spiral movement of the wire around the cylinder in Fig 5a, you will be able to explain using your left hand as shown in Fig 5 b & 5c. 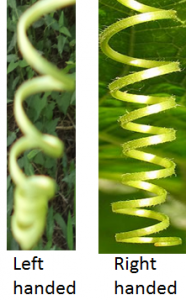 In nature, you will find tendrils coming out of plants that are either right handed or left handed helical structures (Fig 6). 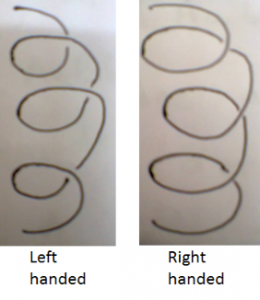 Interestingly, we find both left handed and right handed in case of tendril perversions (Fig. 7) (Aziz et al., 2016). In protein, the α-helix is always right handed (Fig 8). 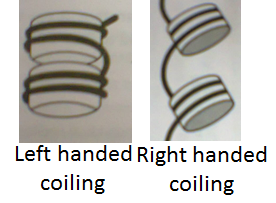 right handed and left handed β- helices, respectively are shown. We can draw right handed and left handed helices (Fig. 10). A left handed helix structure is shown in a marriage decoration (Fig. 11). In DNA, there are two strands. Each strand is a right handed helix. So DNA is a right handed double helix (Fig 2). 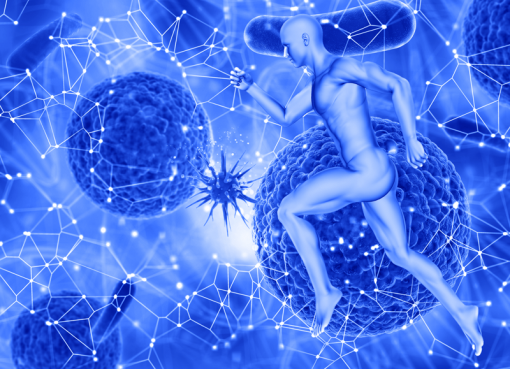 In case of collagen, there are three protein strands coiled around each other in a right handed fashion. So it is a right handed triple helix (Fig 12). 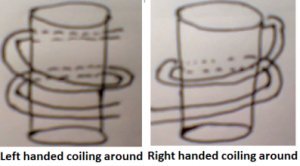 left handed coiling is schematically shown in the left side whereas right handed coiling in the right side. It is pertinent to note that the right handed double helix DNA always wraps around or coils around histone protein in left handed fashion. While reading the book Biotechnology (Reference 3): a problem approach, I realized the schematic presentation of nucleosome in page 636 is correct (left handed coiling) (Fig 14a left side) while the schematic presentation of nucleosome in page 639 is incorrect (right handed coiling) (Fig 14 right side). I hope this small write up will be useful for the teachers and students to define handedness in helical structure correctly. I learnt DNA structure is a right handed double helix since 11th class from Biology text book. But I could not get the courage to ask my teacher as to what is a double helix. Same also happened in BSc though I came across more of double helix structure of DNA and alpha helix structure in proteins. During my BSc practical examination, during DNA model building assignments, my teacher Dr. Bijoy Kumar Das, Christ College, Cuttack, correctly explained the DNA structure as a twisted ladder which I remember vividly even today. Still my understanding about right and left handed double helices was incomplete. In my MSc and in PhD days, I ignored my ignorance and could not gather the courage to ask my teacher or friends to learn it. 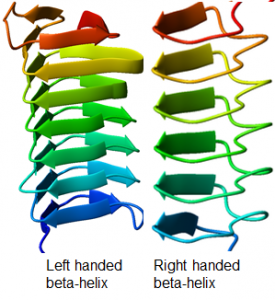 In fact during my PhD, I had a topic on right handed and left handed β-helices in adhesins. I did not have a clear understanding about how to differentiate the two structures. It all happened during my teaching to MSc students at Tezpur University, where I openly declared my inability to differentiate between a right handed and a left handed helix. To my surprise, the humble approach helped me to learn from my students gradually in three years of teaching what is a double helix, how to discriminate between the right handed helix from the left handed helix. I have the proud privilege to tell names of the earlier MSc students: Kamal (2001-2003); Sandeep (2002-2004) and Ankur (2003-2005) who helped me to learn about the handedness in helix. “Understanding DNA” by Calladine and Drew is a good book to read. I thank Prof. A. K. Buragohain, the founder Head, MBBT Tezpur University, who had created an excellent library facility at the Department of Molecular Biology and Biotechnology when I joined the Department in 2002. I also thank Ms. Trainee Phukan, Ms. Kristi Kabyashree, Ms. Ruksana Aziz and Mr. Dhruba Jyoti Sarma, for their help in collecting several Figs. Some of the Figs such as in Fig 1, Fig 2, Fig 8 and Fig 9 are taken from the google search in the internet. These are gratefully acknowledged. Aziz R, Barman A, Bhattacharjee U, Kumar R, Kalita E, Ray SK. (2016), Tendril perversion in Cucurbits. Everyman’s Science, L, 289-294. Calladine CR, Drew HR, Travers AA. 2014. 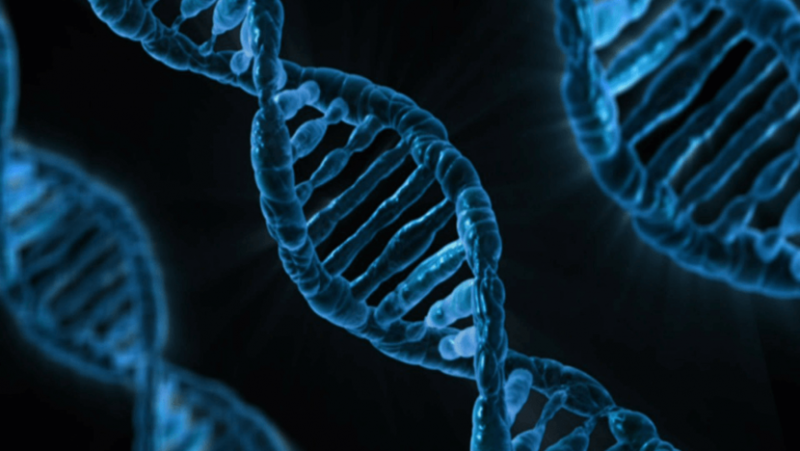 Understanding DNA: the molecule & how it works. Academic Press. Kumar P, Verma P, Mina U (2017) Path finder publication. Page 636, 639. 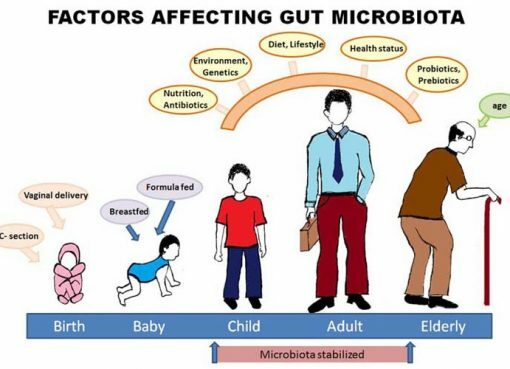 Healthy gut for healthy life!